Book Reviews: Discover to Deliver and Impact Mapping | DragonFire Inc. I recently read two new books: Impact Mapping by Gojko Adzic, and Discover to Deliver by Ellen Gottesdiener and Mary Gorman. I have posted both my reviews below, but I wanted to add a few words about the synergy I felt between them. I believe that if delivery teams use both techniques – Impact Mapping to get a really good idea of what we want to build, and then take lessons from Discover to Deliver to consider different dimensions of what we are building, then teams can really learn to delight their customers. Software development ideas do not stand still, and these books show that we should continue to explore new ways to always improve. Easy to read, but powerful concepts presented. The first thing I tried after I finished reading Impact Mapping, was to try it out on one of my own exercises. I found it fascinating how differently I thought of what I wanted to accomplish. By creating a simple map of a real situation, I learned so many things that I hadn’t even considered. I do recommend trying to draw an impact map on something concrete to cement the ideas. I have used mind maps to get clients to think about areas that might be affected by new features, but impact maps go one step further. They give us concrete ways to consider how measurable goals are supported by stakeholders (actors), and how those actors are impacted (negatively or positively changed behavior) before we even think about the deliverables. I believe this is what many teams are missing in their development cycle, answering the question “ Are they really building something that matters”. 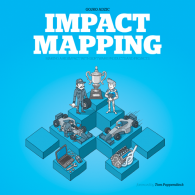 In Impact Mapping, Gojko Adzic has brought together many ideas from different sources. Simplicity at its finest – complex ideas presented in an easy to read manner. When I was reading Ellen Gottesdiener and Mary Gorman’s Discover to Deliver – Agile Product Planning and Analysis, I had my highlighter, pencil and my sticky notes ready and I’m happy to say that I have many little pink stickers pulling me back to areas of interest, along with the notes I made as I was going through it. My library is filled with paperbacks (I’m not a fan electronic reference books), but I think this is one of my favourites as far as the feel of the book and the turning of pages. There are so many very positive things about the book in general – besides the content. I liked the graphics at the top of the page so you could constantly see where you were in relation to the rest of the book. I also liked the use of pictures to continually remind us of what we were focusing on. There is a lot of theory for people who are new to analysis, but Ellen and Mary use case studies and practical examples to demonstrate exactly what they mean. For example, their example of a structured conversation walks through a very typical team conversation showing how complex a very “simple” story can be if the right questions are asked. They examine ways to look at the feature to bring out the important factors the team needs to consider. Discover to Deliveris not focused on one delivery method but how to adapt to the one you are using. So much depends on your context and perspective, and I think Ellen and Mary have done a tremendous job of giving techniques and tips on how to adapt to the one you are in. I recommend this book to all team members to read. I’m sure each one will get something different out of it.